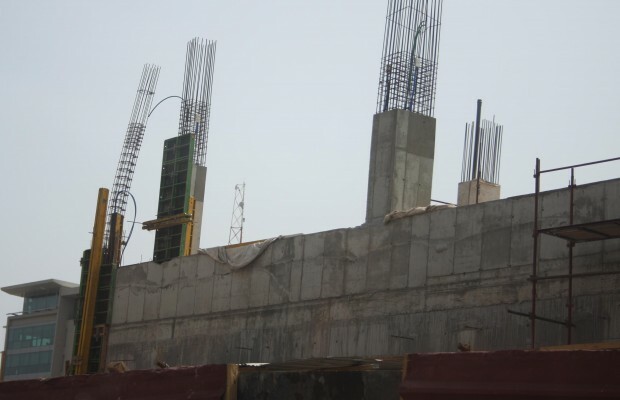 A construction worker working on a ten-storey building belonging to the Export Development and Agricultural Investment Fund (EDAIF), James Quarshigah, died when the first floor of the building caved in on Sunday in Accra. James Quarshigah died following the caving in of part of the building being executed by Israeli company AMANDI Holdings Limited, a subsidiary of SuperTech Limited (STL) of EC’s biometric voters’ register fame. AMANDI Holdings Limited has received several contracts from government including the renovation of the arrival hall at the Kotoka International Airport among others. Sunday’s accident, which saw ten other workers sustaining various injuries, has sent shivers down the spines of the workers, who have since complained about their safety on the site and expressed fear that the whole building would collapse in future because of some obvious defects. According to the workers, the inferior materials used and the fast rate at which the building was being put up accounted for the collapse. Speaking about the incident on Monday, they said the building caved in while they were casting concrete on the first floor. “We the workers on this site won’t be surprised if that building collapses totally in future because we have been working with them from foundation. You have no idea the rate at which the contractors forced us to get to the level the structure is now. Before this incident on Sunday, any one of us who is assigned to go and work on the ground floor is always afraid. As we were casting concrete for the first floor, it caved in together with the fresh concrete and iron rods,” they said. They recounted that the deceased, James Quarshigah, met his untimely death at the ground floor of the building while fixing the support beams while the rest cast concrete simultaneously. The 10 workers who sustained injuries from the incident were rushed to the Ridge Hospital, 37 Military Hospital and the Adabraka Polyclinic for treatment. When the site was visited, work had halted and there was heavy police presence. ACP Sabina Osei-Bonsu, Accra Central Divisional Commander, said the site had been barricaded to prevent anyone from tampering with evidence at the scene. “Investigations are currently ongoing but the Accra Mayor, Alfred Oko Vanderpuije, had also ordered some engineers with the Accra Metropolitan Assembly to form a technical team as soon as possible to investigate the incident. Our checks today revealed that most of the injured persons have been treated and discharged,” Miss Osei-Bonsu said. Meanwhile the workers have alleged that they were forced by the site and project managers to work 17 hours for seven days. “Some of the workers work from morning, 6am, till 12 midnight and once you complain that you are tired they will sack you. Even our remuneration as compared to the work we do on the site is appalling. If you get hurt on site, the best the site manager will recommend is that you should be sent home. Once you are sent home, that is the end,” another worker disclosed. Some other workers noted that they had no off days and if for any reason they missed work for a day, they would be sacked. “Artisans are paid GH¢25 while labourers are paid GH¢20 per day. The site manager and project manager have put fear in workers that with the slightest thing you will be sacked,” they disclosed.